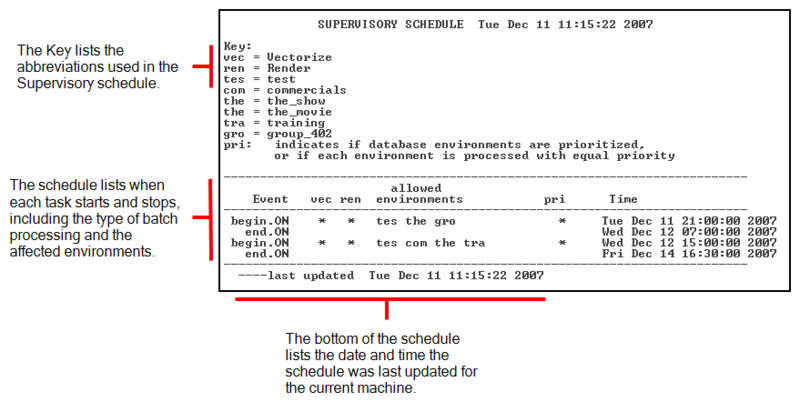 When you display a Supervisory schedule, you can see all the batch processing machines that use this schedule and when they are scheduled to perform the batch processing. The Supervisory schedule also displays the type of batch processing work (vectorize or render) and the environments that are scheduled for the processing work. After you display the Supervisory schedule, you can modify it to change the time, type of batch processing, or environments to process—see Setting Supervisory Schedules. NOTE You can display the Supervisory schedule for only one machine at a time. You are prompted for the machine whose Supervisory schedule you want to view. Type the name of the machine for which you want to define a Supervisory schedule. If you press Enter/Return without specifying a machine, the command uses the machine name that appears in brackets. You can combine these two steps by adding the name of the machine you want to view at the end of the Showsup command. For example, if the machine you want to view is called hickey, then you would type the following command in a GNU/Linux shell to view its Supervisory schedule. The Supervisory schedule for the machine appears.